AUCKLAND CITY LIMITS SET THE CITY ALIGHT WITH SOME OF THE HOTTEST NAMES IN MUSIC. SAMSUNG TECHNOLOGY WAS AT THE HEART OF IT ALL, ON STAGE, BACKSTAGE + IN THE MOSH PIT… THEREFORE SO WAS RAW. TO MARK THE ARRIVAL OF THE NEW GS7 PHONE + HIGHLIGHT KEY FEATURES (LOW LIGHT CAMERA + WATERPROOF FUNCTIONALITY), WE CREATED A SOCIAL + INFLUENCER CAMPAIGN TO ENGAGE CONSUMERS… FRONTED BY GARTH BADGER FROM THIEVERY STUDIO. 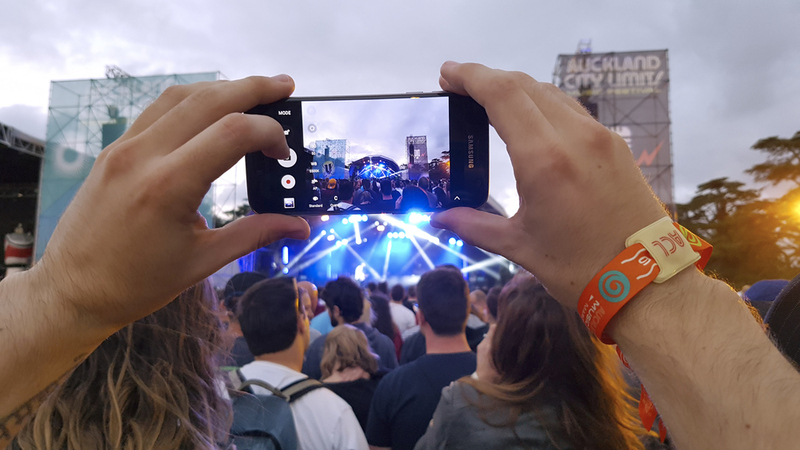 TO FURTHER AMPLIFY THE ‘#GS7JOINTHEBAND’ CAMPAIGN – A VIRTUAL REALITY EXPERIENCE THAT SAW PUNTERS SECURE A SPOT ‘VIRTUALLY’ ON STAGE, GARTH DOCUMENTED THE FESTIVAL USING THE GS7. WE THEN PARTNERED WITH REMIX TO PUBLISH THE CREATIVE PROJECT.